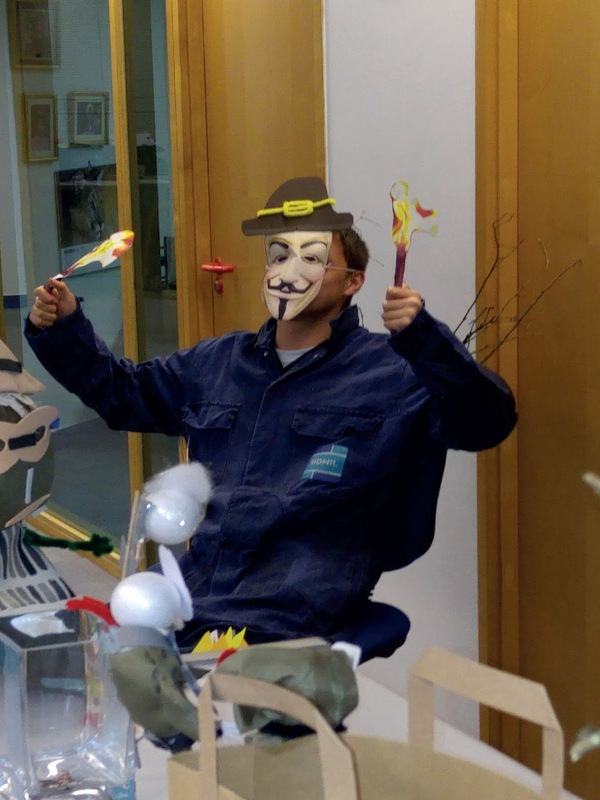 Sidhil News: Funny Guys on Bonfire Night at Sidhil!! Funny Guys on Bonfire Night at Sidhil!! Friday at Sidhil was a good day, as we took part in the Bonfire night celebrations, with an aim to raise money for our chosen charity Forget me not Hospice... Lots of activities had been planned to keep us extra busy including one of Clive's infamous (and also very impossible) quizzes, a raffle with some cracking prizes, bonfire treats and also probably one of the most fun (and competitive) activities our Build a miniature Guy (or girl) Fawkes competition!! We had some excellent entries and thank you to all of the departments that took time out of their busy days. Each department was given a goody bag full ingredients in order to create their master pieces. The all important goody bag!! M@H - Fantastic effort, not sure how the poor monkey feels about being set alight..!!! Purchasing Department - Simple and to the point but also load of rubbish!! Clive and James Brookes entry - Gone for the Girl Fawkes angle, due to the fact she was slightly top heavy... we had to help keep her upright!! Customer Services - Is it a Guy or a Teenage Mutant Ninja Turtle...???? Contracts Team - Definite mis-use of company property by roping in our test dummy! Service & Maintenance - Excellent use of a real boy, dressed up in a Sidhil boiler suit!!! R&D Department - And finally Our Winner!! 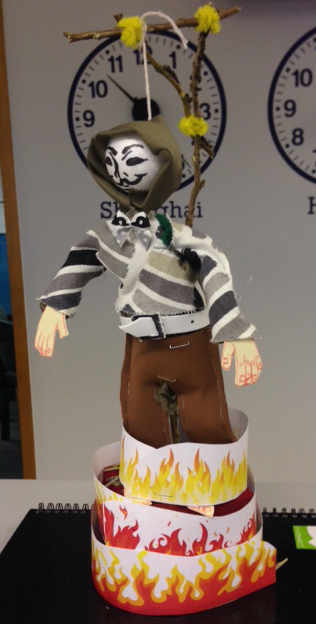 The R&D boys didn't let us down with their very creative and realistic effort!! And to celebrate their win we gave them a tub of Celebrations!!!! Yay!!! 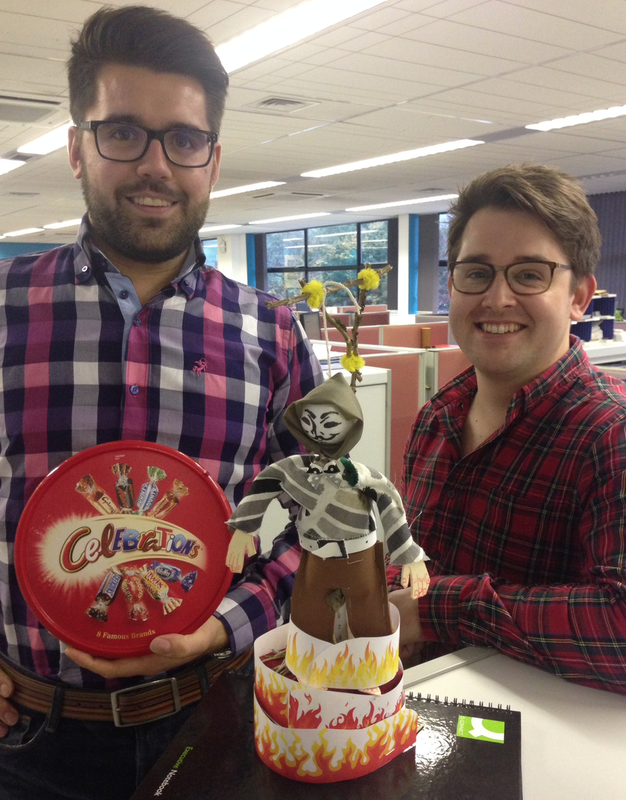 Sam and James with their winning entry!! Also, a big well done to Kim Bingley, Caroline Shannon and Kim Foster who took the Raffle prizes and Sarah Holindrake who won our impossible quiz!!! We raised an amazing £120 for Forget Me not on Friday, thank you to everyone that took part!!! !